We have got an eggciting Easter competition coming up, from 8th to 21st April! A selection of residents at seven of our residential care homes across the UK have been busy in their craft activity sessions, decorating a handful of rocks in bright, colourful designs in preparation for a community involvement Easter Hunt competition! Children and their families within the neighbourhoods of the care homes taking part are invited to venture out into their local areas for a eggcellent adventure over the Easter school holiday break, searching for our hidden rocks. A total of five beautifully, hand decorated #EasterRocks will be placed in undisclosed locations within the local communities of the care homes taking part, named below, on 8 April, ready for the Easter Rocks competition to begin. Families should keep their eyes wide open to seek out and spot one of our special rocks, hidden low and high, in nooks and crannies, in well-known community locations and landmarks, from 8th-21st April. Our lucky Easter Rock finders are then invited to exchange their magnificent discovery for a delicious Easter egg prize at their local care home location which is stated on our pinned up A3 posters dotted around. The competition will unfold on social media in posts published on our Facebook Page using the hashtag #EasterRocks with winners photos being posted with their prizes. 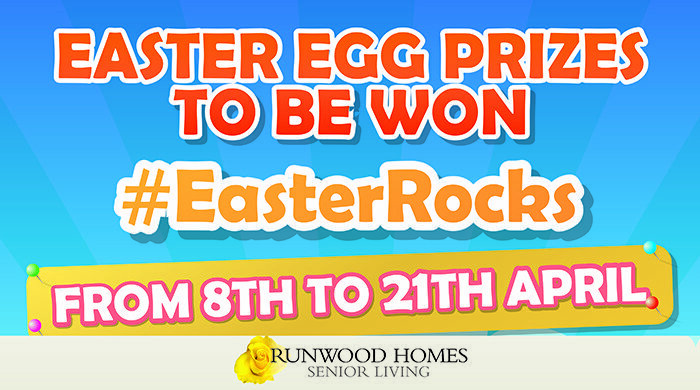 We wish all Easter competition rock hunters the very best of luck in their search for one of our Runwood Homes Easter campaign rocks which our residents have been so kind to create for children in the local community to find and they look forward to meeting the rock retrievers! Please help others find out about our competition by using the hashtag #EasterRocks on any social media posts and photo uploads. Children should be accompanied by adults. Competition winners must be in possession of one of our hand painted rocks only, no other version. Winners should exchange their rock for a chocolate Easter egg prize at the care home location stated between the dates of 8-21 April 2019. Winners and guardians must agree to have their photograph taken and sign a media consent form for images to be used for marketing purposes. #EasterRocks This Runwood Homes campaign provides a great activity for children to take part in during the Easter holidays out of the home, it strongly supports intergenerational engagement, creates interest and physical activity for our care home residents as well as helping establish or reinforcing great community links and relationships.